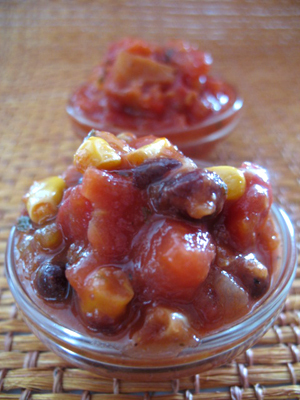 Salsa Bobos is laden with large chunks of tomato, black beans and kernels of corn. Behind it, Cowpoke Artichoke Salsa. Photo by Melody Lan | THE NIBBLE. 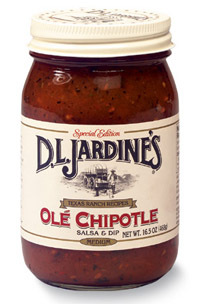 WHAT IT IS: Gourmet salsas. WHY IT’S DIFFERENT: Twenty-three different flavors, mostly tomato-based, each truly different from the rest. WHY WE LOVE IT: Top-quality ingredients and mouth-watering recipes. Plus, the wide range of choices means that no matter how much you love salsa, you’ll equally love the anticipation of discovering something new. This is Page 8 of an eight-page review. Click on the black links below to visit other pages. 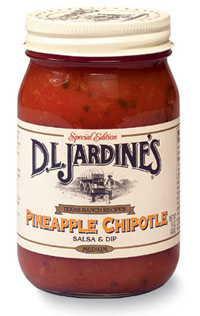 Salsa is more than a dip and a topping for nachos. It’s also an exciting ingredient for recipes. It does well crossing over into the Italian arena. Try these recipes for manicotti and rotini pasta, as well as for pork tacos. 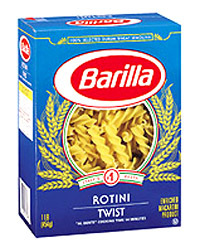 Cook pasta according to package directions, without salt or oil, to al dente stage. Rinse with cold water to stop cooking, drain and set aside. Stir together ricotta cheese, green onions, cilantro, mozzarella and egg substitute. Coat an 11" x 17" baking dish with cooking spray, and pour 1/2 cup salsa in the bottom. Spoon cheese mixture evenly into shells, and arrange in the dish. Pour remaining salsa over shells. Bake at 350°F for 20 minutes. Sprinkle with Monterey Jack cheese. Bake 10 more minutes or until thoroughly heated and the cheese melts. Let stand 10 minutes before serving. This dish can be served warm or as a cold pasta salad. Boil the pasta in salted water for 8 to 10 minutes, or until al dente. Season chicken breast with 1/2 teaspoon of garlic powder and brown in 2 tablespoons of olive oil. If you are using salad shrimp, thaw and sear with olive oil and garlic for approximately 2 minutes (do not overcook). Cube the chicken and mix with the pasta and artichoke salsa in a large bowl. Serve immediately with parmesan cheese, or cover contents and place in the refrigerator until you are ready to serve. peppers. Sprinkle over pork chops. Coat chops evenly with cooking spray. 3 to 4 minutes on each side. FOR ADDITIONAL INFORMATION, special offers, contests, opinion surveys, THE NIBBLE prior issues archive, product gift-finder and more, visit the home page of TheNibble.com. ABOUT THE NIBBLE. THE NIBBLE®, Great Food Finds®, is an online magazine about specialty foods and the gourmet life. It is the only consumer publication and website that focuses on reviewing the best specialty foods and beverages, in every category. The magazine also covers tabletop items, gourmet housewares, and other areas of interest to people who love fine food.